1In this article we re-examine and question the ideological status of Blasket Island literature. Moving away from the usual emphasis placed on history and memory, we attempt to deconstruct the myth of authenticity in terms of its literary discourse, a discourse that produces and is produced by its subject-author. We first show how the authorial subject was historically and discursively constructed before focussing on two specific aspects of the subject’s literary mythology, that is its double rapport with language and voice. 2This paper offers a reading of the central chapter of Sean O’Casey’s Autobiographies, namely the final chapter of the third volume, which is entitled «The Bold Fenian Men», and relates the events of Easter 1916. It first studies the various masks of the character of Sean (as bird of ill omen, grotesque anti-hero and sympathizing witness), then the ambiguities of a narrative voice which constantly lets other voices talk (the voices of the people, or the allegorical voices of Ireland at the moment of sacrifice), and examines the interaction between the individual progress of the protagonist and the history of the Irish nation, and the extent to which O’Casey renews the autobiographical genre by giving pride of place to collective history. 3Borstal Boy (1958) is a complex autobiographical work relating the three years spent by the young Behan in Borstal, England after he was convicted of IRA terrorist activities. However, the text, as a political statement, also conceals an in-depth questioning of the autobiographical status of the author and of his recurring tendency to stand for the Republican cause. In addition, one has to envision Borstal Boy as a work in progress which was initiated as early as the 1940s, and clearly points to an evolution in Behan’s political radicalism. The activist’s voice, although it is first denied in a hostile prison environment, increasingly seems to blend in with the numerous hybrid voices of the other prisoners, to the extent that it even reaches the point where it becomes impersonal. 4One Day in My Life is the prison journal of Bobby Sands, an IRA prisoner detained in Long Kesh, Northern Ireland in the late 70s. In this diary, Sands describes a day like any other during the four year no-wash protest that republican prisoners embarked on in 1976. The story is compressed both in time and space, and is told in the first person not so much to individualise the narrative as to give it a universal value. Page after page, Sands talks about the boredom, the pain, the violence, the loneliness of his daily life, but also, about his political struggle and his determination not to give in, to see this protest through, even if it the price to pay is life itself. Through the autobiographical genre, Sands left a posthumous political testimony of his struggle. 5Political autobiographies may be divided into life stories inscribing their authors in a great collective movement, and assertions of a unique individual fate that distinguishes their authors from the masses. Conor Cruise O’Brien belongs to the second group. He points to what keeps him aloof from the great Irish collective movements, nationalism and religion, his distinct education and training that gave him a clear insight into his native country. But it seems that the staging of an individual fate is also part of a conscious strategy for the conquest of influence and power. 6In the last years of his life, William Carleton wrote his autobiography, left unfinished at his death in 1869. The author defines this as «a melancholy task […] the narrative of a continued and unbroken series of struggle, difficulty, suffering and sorrow.»Asserting his originality – «I was no ordinary man» – he wants to shine by all means, physical and intellectual. A shameful educational system is the major obstacle placed on his way to knowledge and fame, but a few books, from the Aeneid to Gil Blas are most helpful friends. Carleton’s Ireland is made of a litany of place-names, of his love for nature – «I was a strange boy with a good deal […] of natural poetry in me» – and of a cultural treasure inherited from his parents. Carleton is the historian of a vanishing way of life, yet he distances himself from it, at the levels of religion and politics, «knowing no party but my country.» Autobiography and fiction (Traits and Stories of the Irish Peasantry) form an organic literary whole where frustrated aspirations, dream and reality, coexist and combine. 7In his Autobiographies, Yeats reconstructs experience in a verbal form. He crystallizes his egocentricity within his aesthetics. His literary style and his style of life merge as he explores his experience to lay bare its meaning and put it down on paper. To make his narrative more theatrical, he uses dramatic scenes, décor, dialogues, mask and metaphors. The poet’s life also becomes the starting-point of myths. It is moulded by the figures of traditional rhetoric – irony, contrast, resemblance, poetic techniques. Moreover, the author resorts to the impressionistic fragmentation, also present in Joyce’s Portrait. The logical sequence of time, the relation of cause and effect are not always respected, giving an impression of simultaneity. The author plays with tenses, present, preterite, perfect. Beneath the presentation of the self and his surroundings a pattern emerges, giving the work its coherence. So the style offers a true image of the narrator’s personality, even if he has some doubts about the feasibility of an exhaustive portrait. 8MacNeice wrote The Strings are False: An Unfinished Autobiography at the out-break of World War II in a period of personal crisis. This experiment in autobiographical prose writing provides a valuable testimony on a world that was about to disappear. It also fulfilled a therapeutic function for its author. In these circumstances, the activity of writing seems to have been a prerequisite for political involvement. But for MacNeice writing often means rewriting. The comparative study of two autobiographical pieces on the same theme provides relevant clues as to MacNeice’s writing process and shows the extent to which this literary reworking gives The Strings are False its singularity. 9Autobiography, for Elizabeth Bowen, is a means to recompose personal and social identity. Bowen never separates singular identity from collective identity, and sees autobiography as a way of restoring historical and political legitimacy to her class. In Bowen’s Court (1942), Seven Winters (1943) and Pictures and Conversations (1975), she recounts the history of the Bowen family in County Cork, her own childhood in Dublin and her adolescence in England, insisting all the time on the connection she sees between personal experience and writing. Although selective about her confessions, she consciously guides her readers and critics along specific points of interest, in order to ensure that they too perpetuate the memory of her extinct community, that of the Anglo-Irish. 10This study examines the term «memoir(s)» in connection with the autobiographical genre. It is obviously related to the author’s memory, which is inhabited by numerous characters from McCourt’s own personal universe whose destinies have sometimes been shaped by great historical events. This paper focuses on a family saga being played out against a historical background. It underlines that great historical figures were not the only ones to accomplish heroic acts, notably Angela whose symbolic name links her to heavenly beings and who is, to the author, as worthy of admiration as any other well-known celebrity. Finally, it attempts to explain the reasons why Angela’s Ashes was and still is a bestseller. 11’Tis by Franck McCourt contains every ingredient of an immigrant’s autobiography: the American dream and the motivation for departure, the crossing, anticipating here the moment of mourning for the loss of the birthplace, the arrival, initiatic rites and trials, overcome thanks to solidarity among minorities; then regret quickly follows, with an inverted idealization of Ireland, the recreation or reinvention of Ireland through ethnic experiences; the reassessment of the protagonist’s identity, betrayed by his accent, caught in an in-between, where the arrangements of religion demystify it. Then come disillusionment, the toppling of the dream, of the Hollywood utopia in a castrating, sometimes xenophobic America. A dream eventually is born again though, that of education, when writing becomes soteriological, when America becomes the sesame to literature. The inevitable Nostos, coming back to the Old Country, brings its own disillusionments. The confrontation reveals the hero’s atavic gregariousness, which justifies inadaptability, the avoidance of intregration. This redemptive autobiography, characterized by a hubristic carnivalization, and a humour more or less absent in Greek-American autobiographies, distances events, precludes self-pity, and accompanies a rebirth. It pays the immigrant’s debt: he has received his history as a legacy, and pays homage to both countries, old and new, hence its wide success in America. 12An Béal Bocht (The Poor Mouth) is based on pre-shaped data or «hypotexts» such as Gaelic autobiography – with its stylistic and genre features – and clichés, stereotypes, received ideas, which all concur in giving cohesion to the social group. But subversion works its way into this stable, accepted structure through various devices such as exaggeration, irony, mishandling, the grotesque, the absurd… now sotto voce, now obtrusively. Subversion no doubt serves the aim of the satirist and of the moralist but the following pages will show that for Myles reconstructing through borrowing is an eminently playful activity. The world of words is given precedence over everyday reality. Satire recedes. Recreation (and re-creation) is for reader and writer alike prevalent. 13In contrast to a number of traditional Irish autobiographies in which the individual voice of the autobiographer is the mouthpiece of the community he or she belongs to, Sean O’Faolain’s autobiographical writings are characterized by the emergence of the singular voice of a writer who is eager to construct /construe his identity as different from his community – in this case to emphasize his defiance of the triad «Family, Fatherland and Faith», that is of everything he inherited from his family and from the (Anglo-)Irish community. Writing thus amounts to an act of dissident self-construction for O’Faolain. However, despite its uniqueness and singularity, O’Faolain’s voice is necessarily involved in a dialogue with other voices, and chiefly those which he first endeavoured to reject. The various inflections and, at times, the dissonance of O’Faolain’s voice in his autobiographical writings stems from this dialogue, which may be seen as a form of «intervocality». 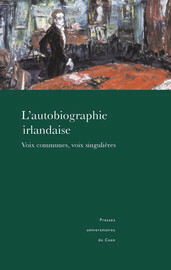 Summaries In : L'autobiographie irlandaise : Voix communes, voix singulières [en ligne]. Caen : Presses universitaires de Caen, 2004 (généré le 25 avril 2019). Disponible sur Internet : <http://books.openedition.org/puc/747>. ISBN : 9782841334551. DOI : 10.4000/books.puc.747. Amiot-Jouenne, Pascale, (dir..) “Summaries”. Caen : Presses universitaires de Caen, 2004. (pp. 303-307) Web. <http://books.openedition.org/puc/747>.